The Remarkable Symposium was all I expected it to be and more. 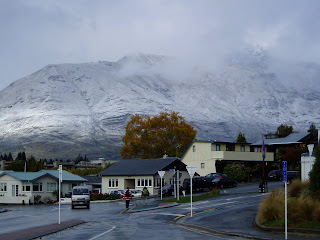 The first morning there made me very glad that I'd packed my gloves and merinos - the snow was so far down the hills even the locals were saying it was cold! 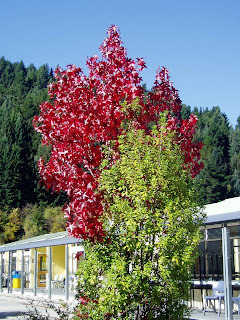 The autumn colours were just stunning. They are always so much more vibrant down South than they are in Northland - I guess it's the crisp weather that does it. I thought the exhibitions were very well hung and there was some fabulous work on display. I've promised myself (as I do every two years) that next symposium I will have something to enter. 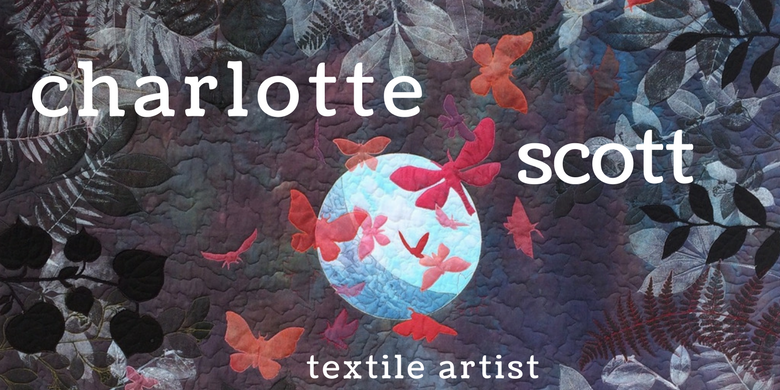 It would be an honour to have something juried in to hang up with work from such talented quilters as we have in New Zealand. I didn't take any photos of the exhibition quilts, it was just too big a task, so I ordered a CD instead. 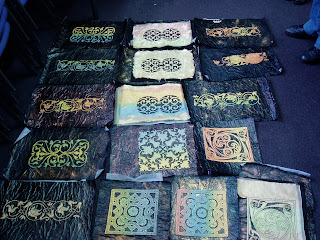 On the first day of classes I spent a fascinating day with Yvonne Brown, melting synthetics and making celtic designs. She's given me a real kickstart and I'm now all enthusiastic to try out the same techniques at home. 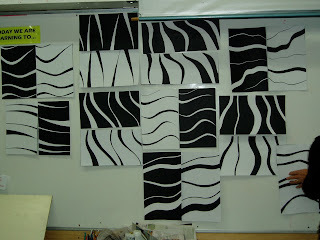 I then spent two days with Jane Sassaman, playing with patterns and I now have a whole new way of playing with design. 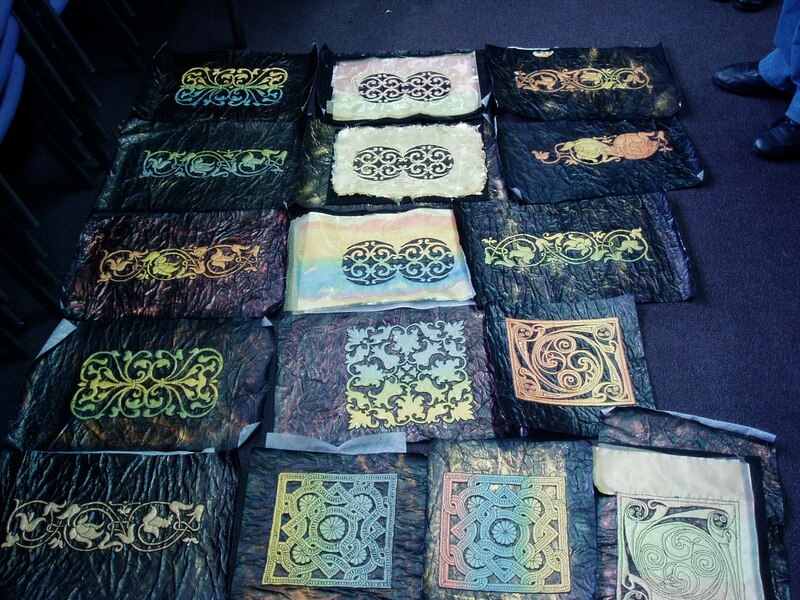 She really opened my eyes to all the patterns and design possibilities around me and I can't wait to finish the piece I started in her class. I have to say that her workmanship on the quilts she brought to show us is just immaculate - something to aspire to. And then finally, two days with Jeanette DeNicolis Meyer, playing with line. She might be coming to New Zealand again in February and if so, she has my details to organise a workshop in Northland. Jeanette is an amazing tutor and I'd jump at the chance to do any of her classes. 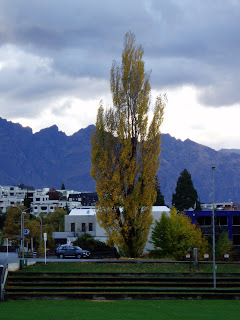 I met lots of new people, saw lots of great quilts, met a fellow blogger in real life, had peaceful evenings with no kids, gained stacks of inspiration and enthusiasm and I can't wait to do it all again in Taupo, 2013. Once Symposium was over for another two years, I travelled to Amberley, just north of Christchurch to visit with my good friend and her family. I trained as a midwife with her more than a decade ago and don't get to see her very much, but she is one of those friends who you can just pick up where you left off, comfortable as ever. Thanks M! Thankfully their house hasn't sustained any major damage from the earthquakes, but they are fearful and a bit strained. 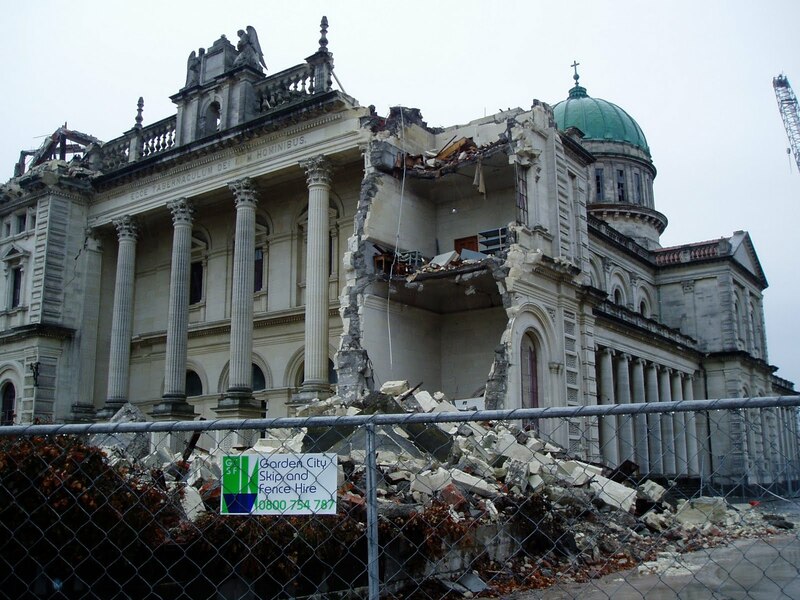 Her hubby and I took a drive round the suburbs of Christchurch and it was kind of hard to take in the scale of the damage. Sometimes you would look at a street and wonder why it didn't look right, even though there was no obvious damage. Then you realised that all the rooflines were just slightly out of horizontal. Sobering stuff. Take care everyone. It's good to be home. I'm in Auckland airport using a sticky keyboard, the bottles of water are $4.00 and there seems to be a shortage of fresh air. But I'm on my way!! 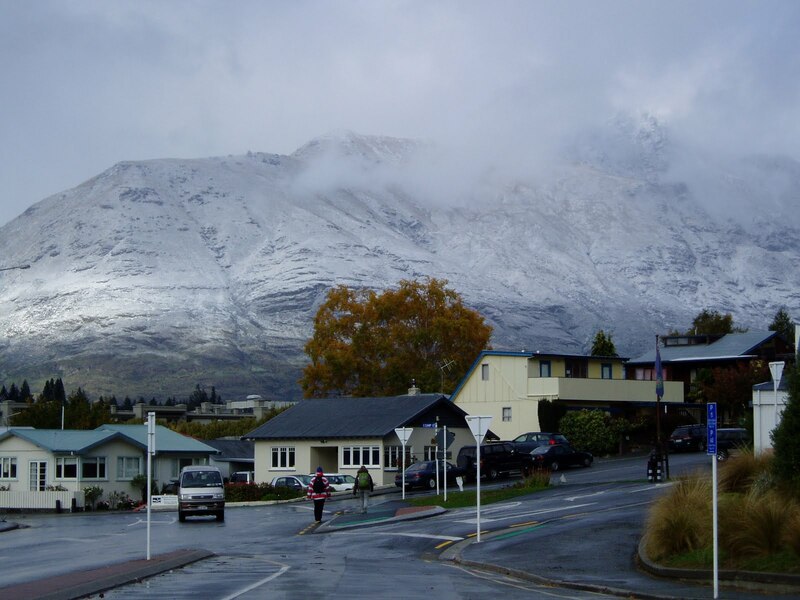 Off to Queenstown for a week of fun and learning at the Remarkable Symposium. I'll see you back here in a wee while - I think I'll be far too busy enjoying my kid-free, responsibility-free, holiday to blog much and I'm not going to feel an ounce of guilt about enjoying myself either! Have fun! 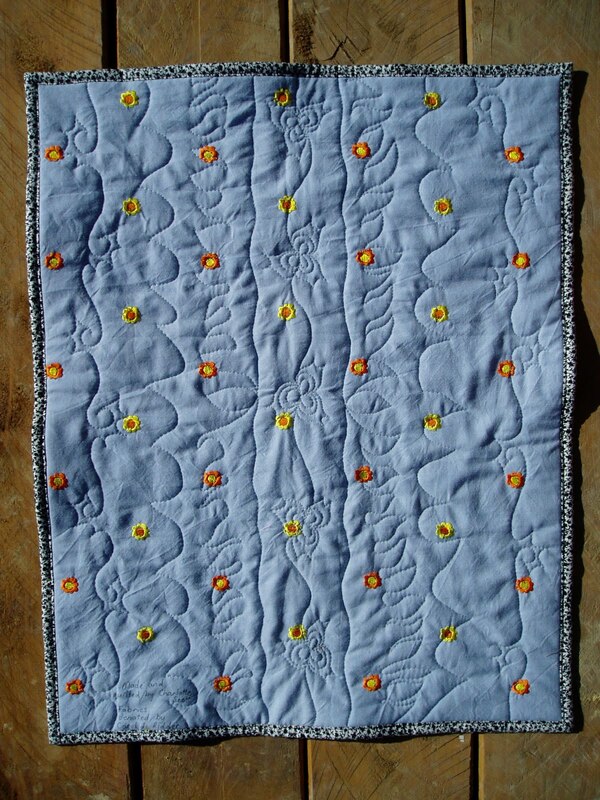 This is another little bassinet quilt for the Maternity Unit at out local hospital. They are such a great size for practicing my machine quilting. You can see how the variegated thread used here shows up much better on a solid fabric than a patterned one. ﻿This quilt was quilted in a row-by-row way. 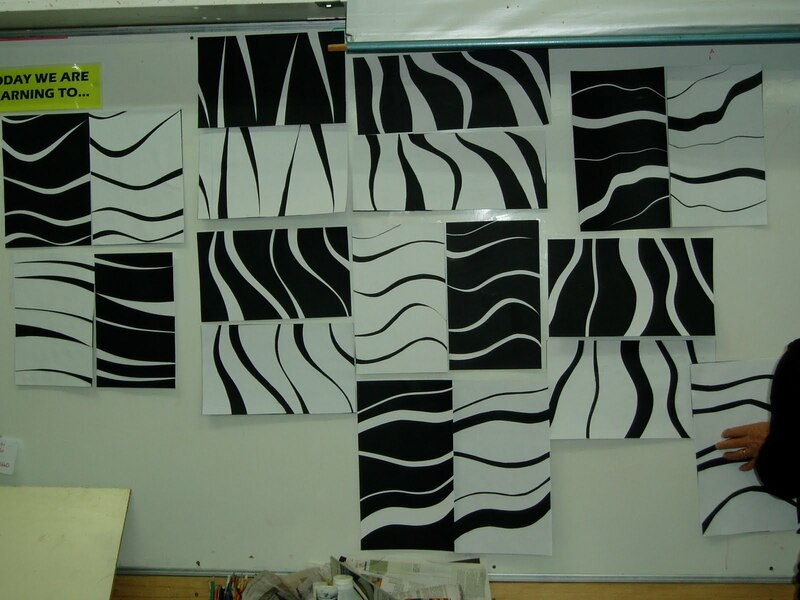 You start with one line in one pattern and then add another one and so on until it looks as complex as you want. You can see it better on the back. I think I need to invest in a really good machine quilting book for myself - anyone got any suggestions? "Can I take a picture, Mum?" Yes, my car is filthy. My excuse is that I live down a dirt road! Sure. Why not? 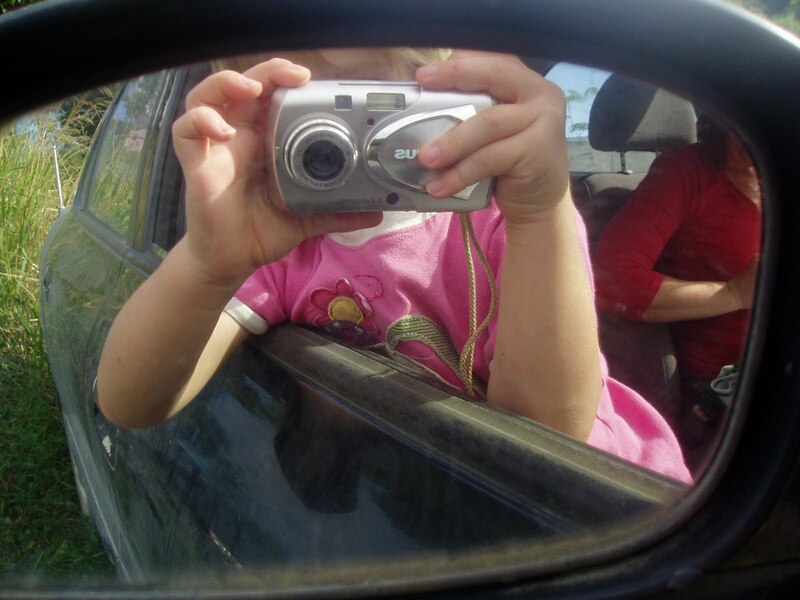 Especially when you take such sweet pictures! I don't know what it is about this picture, but I love it. The three year old took it while we were waiting at school for the six year old to finish up. 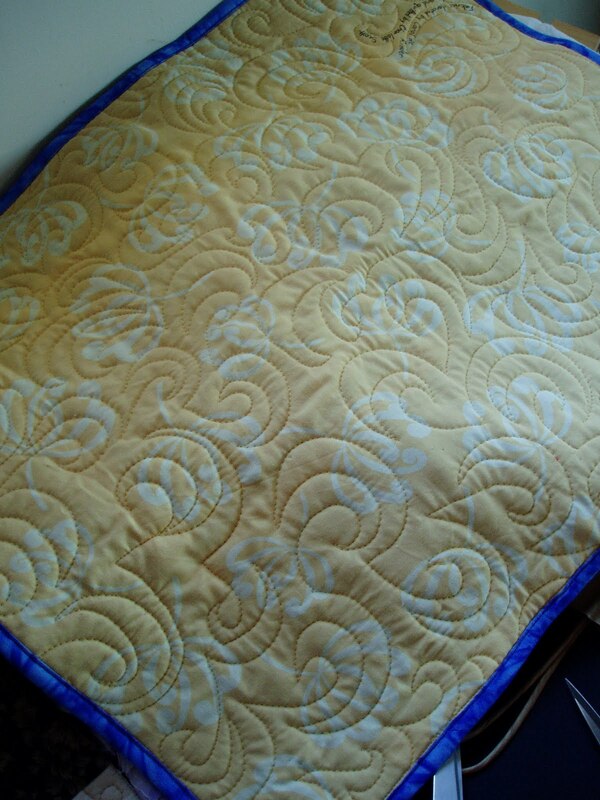 The front of a wee bassinet quilt for the maternity unit. I've been single parenting for over a week now while Hubby takes a well-earned holiday hunting roaring stags in the bush. I have the utmost respect for any parent doing it solo. 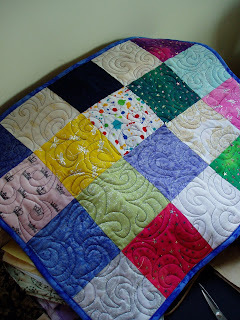 I'm only just managing to squeeze in some quilting here and there. But when he comes back I'm winging my way down to Queenstown for the Remarkable Quilting Symposium! (Insert image of me clapping my hands with glee!) I'm busy gathering my supplies, packing my bags and making sure the house and animals are as sorted as can be for a smooth takeover by Hubby. Five more sleeps to go!! 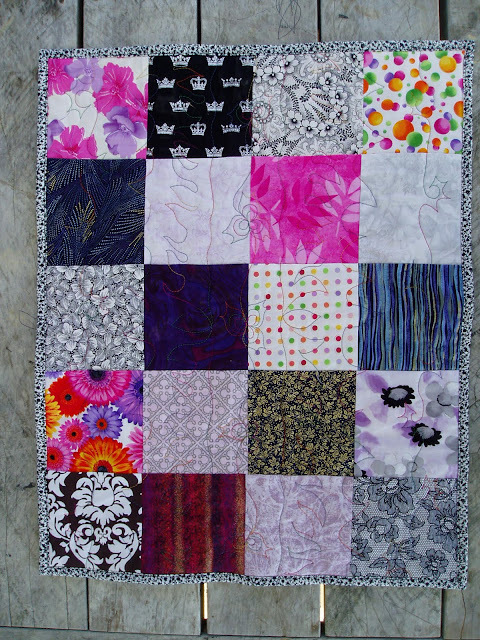 This, when finished, will be the largest quilt I have ever made. And yes, this is the best picture I can take of it at the moment because. It. Just. Won't. Fit. 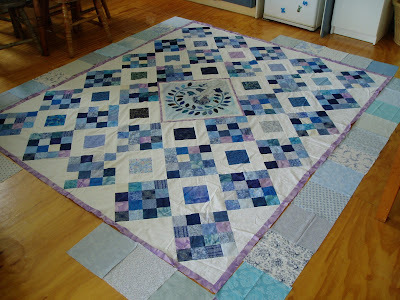 I decided that it needed a border of squares of pale blue fabrics. 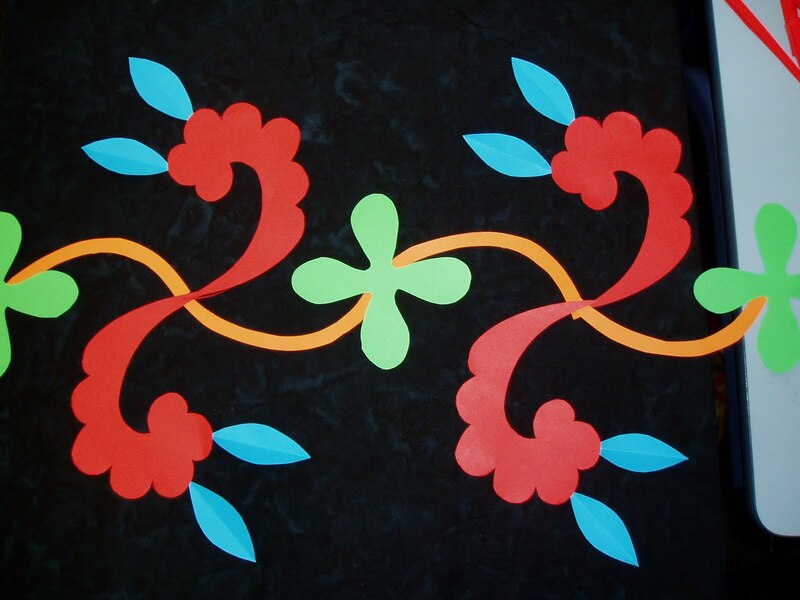 Onto those fabrics I am going to applique vines, leaves and birds in the same style as the centre medallion. Then I think I'll finish it all off with a dark blue border. It will fit nicely over my king size bed with some drape over the edges. My sewing machine is taking a little service break at present so I'm filling in by hand sewing, hand quilting (which is so bad I'm embarrassed to show it), designing screeds of new quilts, and cutting out fabrics. I'm starting to get withdrawal symptoms.